If you don't have "Tool" you need to get this gimmick. David Stone gave a fantastic lecture for a packed house at The Magic Warehouse on Sept 23rd 2012. The magic he performed using "tool" was incredible. We highly recomend this great gimmick and DVD. It's a real tool that will allow you to perform more than 11 routines completely different and easy to do! 11 professional routines, tested on real audience that made David Stone's réputation in close-up! 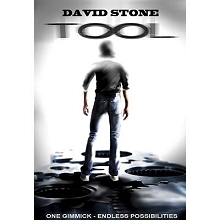 "David Stone has just proved we can start thinking where others have stopped." "Except with a thumb tip, I have never seen so many clever applications with only ONE gimmick!" The perfect Opening trick with cards! A visual color change where everything is given for examination! The magician remove a blue back deck out of a red cardcase and asks a spectator to touch any card. The performer taps the choosen card on the cardcase and its back becomes red! Then the magician taps the cardcase on the deck... that visually becomes red too! All the cards are now red... and are given for examination! The classic effect where the magician can't find the choosen card... He then takes the cardcase to tap gently the wrong card with it : It visually changes into the choosen one! No force, the card can be signed and the effect is really magic and visual! Finally you will be able to perform in professional situation a signed, torn and instantly restored card routine... without any complicated sleight! Do you know how to do a triple lift? Then you can perform this incredible routine in less than 10 minutes! Without a doubt one if the easiest but strongest cards cheating demonstration! Imagine this : You cut the deck in two parts and ask your audience to shuffle them. Get the cards back together and you can instantly produce the 4 aces! (for exemple...). No palm, no sleight, as clean and so easy! 5 - IN THE BOX! Have a card signed and lost in the deck. Explain that to find the card, you need to use your... credit card! Just take the cardcase and caress the deck with it : Your credit card visibly appears on the top of the deck! Give it to the spectator and explain him he can insert it wherever he wants in the deck, he will find his signed card under it. But he fails... You seem embarassed until you realize that the signed card has vanished... Show the cards one by one, the signed card is actually not in the deck anymore! Show your hands completely empty, and grab the cardcase stayed on the table : Open it, and remove the signed card out of it! NO PALM!!! Perform the Sub Trunk in Close-up! The magician remove an ace of spades and a Queen of hearts from the deck, explaining they will both represent « the Magician, and his Partner performing the famous illusion of « The substitution Trunk ». After having given the cardcase for examination, the magician puts the ace of spades inside and close it. The queen of hearts is openly put face up on the deck of cards... Then the magician takes the cardcase and tap on the Queen of Hearts that visually changes into the Ace of Spades! The performer opens the cardcase and the Queen of Hearts is now inside! A visual effect, totally self working , ideal for TV or for children. 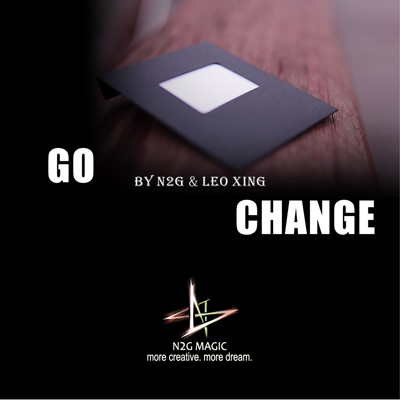 Do you like Mentalism? The performer asks a spectator to indicate him 4 people from the audience who know her very well. Each of them touch a card at random when the deck is held face down and the four cards are slowly put on the top of the deck, without any suspect move. The mentalist asks then to the spectator to turn the 4 cards face up one by one... their value indicates her birth year! Hard to believe, but completely SELF WORKING, NO sleight! Do you know the famous Gaëtan Bloom's Card Stab? 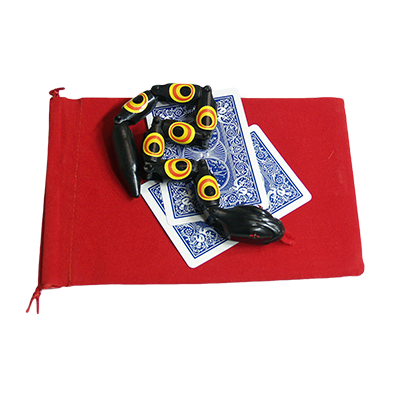 In this version the spectator can shuffles the cards and put them by himself in the cardcase! Then you lock it with a rubber band ... You then gives a kniffe to hanlde to the spectator and drop the cardcase in an empty enveloppe... Suddenly, you impale the bag on the knife : The signed card is stabbed on the kniffe while the cardcase is still closed by the rubber band... Everything is done for examination ... No Palm, just devilish and hyper easy to realize! A card is choosen and lost in the deck in a very clean way. It seems impossible to find it back. The magician takes the cardcase and carress the deck with it as for a magic move : All the cards instantly turn face up! All the cards... except the choosen one! And everything can be given for examination right away! A card is choosen and lost in the deck. The magician explains that to find it back, he will pick 4 cards at random. He clearly shows four cards in his hands and of if them appears to be the selection... A simple magic move, and all the cards vanish except the choosen one! Read that : No Palm! Just a very clever way to use the gimmick for an original and visual application!